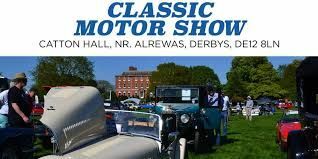 05 May 2019 | Classic Motor Show & Family Fun Day: Catton Hall | Visit www.classicmotorshows.co.uk/catton-hall for more details. A super one day event at Catton Hall for classic enthusiasts and all the family. Up to 700 classic motors including pre and post war vehicles, American and military. Plus classic motorcycles and modified motors! There will be trade and autojumble stands for all those after a May Day Bank Holiday bargain. A classic soundtrack will be played throughout the day, the perfect complement to our interactive arena with vehicle parades including Tamworth Tired Tractors. Make it a perfect family day out with plenty of room for picnics! All in the beautiful setting alongside the River Trent in front of Catton Hall. Our team of judges will be in attendance to select our concours winners with an awards ceremony taking place in the arena at 4pm.